Following their debut Road Race at the North West 200, the GBmoto Racing Kawasaki team now head to the world famous Isle of Man TT, ready to tackle the iconic ‘Mountain Course’ for the first time. Rider Gary Johnson will be competing in the Superbike, Superstock and Senior races for the team. A strong pre-season testing programme saw the GBmoto Racing Kawasaki team work alongside Kawasaki Racing Engineer Ichiro Yoda to build Superbike and Superstock specification Kawasaki Ninja ZX-10R’s. This hard work enabled the team to immediately qualify in second place at their debut Road Race at the North West 200, however inclement weather and minor machine troubles plagued race day. Despite this, the team were still able to further develop both motorcycles and head to the iconic Isle of Man TT confident of a strong showing in all three races. Arguably one of the most iconic motorsport events in the world, the 37 ¾ mile TT course sees rider’s race around closed public roads against the clock, setting an average speed of over 130mph. Already an Isle of Man TT victor, Gary Johnson will be looking to secure GBmoto’s debut roads podium when he competes in the Superbike, Superstock and blue-riband Senior races. Opening practice begins on Monday 1 June, with the Superbike race held on June 6th, Superstock on June 8th and the Senior closing the festivities on the 12th June. “This is it, the big one! The Isle of Man TT is the event that everything else is built around and these two weeks are really the main focus for the year. Heading over this year with a factory team like GBmoto means I’m in a really good shape and can focus on riding, rather than preparing the machines myself. If we just look at the results, then the North West 200 doesn’t look very successful, but the truth is we were able to really improve both the Superbike and Superstock machine. We head to the Isle of Man with two motorcycles that handle incredibly, are very stable and have more than enough power so I’m confident that we’ll be able to be challenging for some good results. 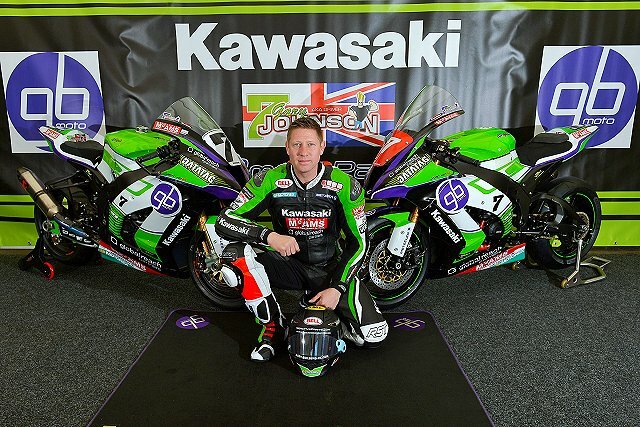 “The Isle of Man TT is a biking mecca, and to be heading over to compete as a factory supported Kawasaki team is something we are very proud to be doing. We’ve had an extensive testing programme that allowed us to develop two motorcycles capable of challenging for podiums and I’m confident that we’ll see Gary up there throughout all three races.